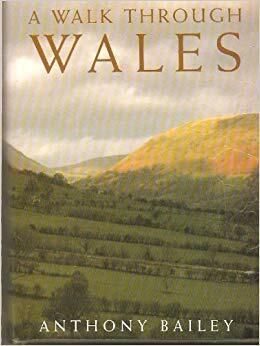 A Walk through Wales, Anthony Bailey (Harper Perennial, 1992), my first contribution to BookJotter’s Wales Readathon. I reviewed Bailey’s book back in 2010 for my other (now defunct) blog, so some of what follows is shamelessly cribbed from that post. Some travel books relieve me of the desire to take a particular trip: Jack Hitt’s tale of walking the Camino de Santiago (see my review here) is one example. Fiction often produces similar effects: books by Eva Ibbotson and Ann Patchett have convinced me that a trip up the Amazon won’t appear on any future itinerary of mine. But in the case of books about places I’ve already visited, my response invariably is to start planning a trip that retraces the author’s route, and right now I’m trying to figure out if October is a good time (weather-wise) to hike through Wales. A hazy sun shone. To the south I had a view over the reservoirs almost to Merthyr. The upper faces of the mountain resembled old light-green velvet, very thin and worn. On the north and east sides Pen-y-Fan fell away in almost sheer drops. I stood for a few minutes a little way back from the north edge, rocking slightly from the strength of the wind that hit the scarp and came over the top…. This wind … felt high, but, as in a sailing boat or open plane, it made you feel as if you were in motion. The air, the wind, was blowing solidly toward Pen-y-Fan, and the earth, the mountain, the summit of Pen-y-Fan, was turning through the wind. Other challenging trails reward Bailey with equally expansive views (when the rain lets up) of meadows and bog heaths, hills and long valleys leading to the sea — the wild terrain that produces slate, peat, coal, and sheep. As we travel with him, we learn history, geography and biography — something armchair travelers expect in such books. But most interesting to me were the conversations he had with people he met along the way, farmers and housewives, festival singers and hotel owners, gatekeepers at castles and toll booths, all with stories of only local importance that, nevertheless, when assembled by Bailey, create a fairly full portrait of this lovely country. 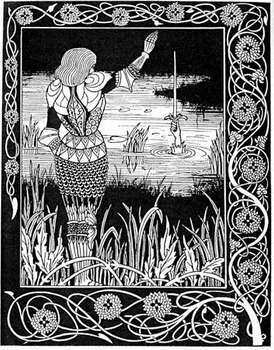 Bedivere casts Excalibur into Lake, illustration by Aubrey Beardsley for Thomas Mallory’s Le Morte d’Arthur, 1894. Bailey is a sailor, novelist, historian, and critic, with books about JWS Turner, sailing the Outer Banks, life in a New England village. In this tale of a coast-to-coast trek that takes him through two of Wales’ national parks, he helps readers understand how history and myth play out in the Wales he saw during his travels — King Arthur, Owain Glyndwr, Dafyd ap Gwilym, King Offa, the Welsh language itself are all topics he wanders through, examines carefully, and then considers as he hikes up the next hill. Bailey has no political or ecological axe to grind, especially as an Englishman in some very anti-English parts of Wales. He does occasionally bemoan the loss of farmland to caravan parks, and can’t help noticing the military jets screaming their way above the otherwise quiet countryside. He also understands Welsh resentment of the English, who in the 1980s and 90s were buying up property in Wales, thus raising housing prices above what most Welsh could afford. Nearly 30 years later, the future of the Welsh language seems a bit more secure, but what about the future of Wales itself in an era of Brexit and widening income gaps? As I was reading Bailey’s final pages, the Welsh Assembly joined with the Scottish Parliament to ask that Brexit be postponed. I felt like a lone sailor at the end of a voyage, wanting to go ashore and yet dreading the loss of independence and the cessation of onward movement; looking forward to going back home but knowing it would involve having to live with the urge to set off again. This entry was posted in Am reading, Dewithon, Wales, Wales Readathon and tagged Anthony Bailey. Bookmark the permalink. I may be like you, Brona. I like the idea of exploring areas by foot, but not the idea of portaging a full backpack across rough terrain. Fortunately, other means of transport exist, as well as books like this one. Hiking through Wales has been a lifelong dream of mine. I wonder if I’ll ever make it. My first trip through Wales was on a bicycle — ouch, those hills! But it was certainly instant love, and I’m always happy to go back. Perhaps, next time once again by bicycle. It may be a long slog uphill, but the reward is just on the other side — views, and freewheeling back down. I have to admit, it’ll take some major training to prep for a bike tour anywhere. And I’ll want a sag wagon! Your review makes this all sound so do-able and reasonable that I’ve got to read the rest of this book, even if, unlike you, I never follow in Anthony Bailey’s footsteps. It’s a lovely book, perfect for armchair travelers, Cath. Thanks for the visit and comment!